There are still 2 days left when you can save money with printable coupon at carter's stores in the U.S. There are 2 ways to save. First one: take 20% off your in-store purchase of $40 or more. Second one: take 15% off your entire in-store purchase (no minimum spending required). 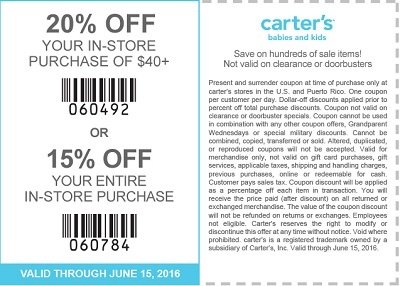 Coupon must be printed to receive the offer at your nearest carter's store location. Source of the information is carter's. For more details visit your nearest carter's store location. Offer expires 06/15/2016.